Carrie Tiffany is on a roll. 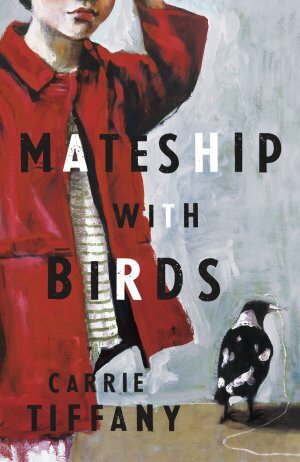 Last month her second novel, Mateship with birds, won the inaugural Stella Prize, and this month it won the Christina Stead Prize for Fiction at the New South Wales Premier’s Literary Awards. It has also been shortlisted for the Miles Franklin award. Many bloggers* have already read and reviewed it so, once again, I’m the last kid on the block, but I have finally got there. – holding out her wing as if it is broken. They also provide commentary on the main story which is, as you’ve probably guessed, a love story. It is, however, no traditional romance. The boy and girl, Harry and Betty, are well past their youth and are cautious, given their previous experiences of love and relationships. They reminded me a little of Kate Grenville‘s rather dowdy protagonists in The idea of perfection. They care for each other in all sorts of practical ways: Betty cooks meals for Harry and tends his health, and Harry looks out for Betty and her children, fixing things when he can. A sexual tension underlies all their interactions – over many years – but it’s not openly expressed. (“When he’s invited to tea he leaves immediately the meal is finished, as if unsure of what happens next”). Harry gradually takes on the role of “father figure” for Michael. However, when Michael becomes interested in a girl and Harry decides to pass on some “father-son” knowledge (“an explanation of things – of things with girls? Of … details of the workings”), including some rather specific physical advice regarding women, Betty is not impressed. It sounds pretty straightforward, doesn’t it, but there’s something about Tiffany’s writing that makes it feel fresh, original. Part of it stems from her particular background as a scientist and agricultural journalist. Again, like her first novel, she grounds the story in her knowledge of farming life, but not in so much detail as to be boring. Rather, her descriptions give the novel its underlying rhythm – the landscape and the creatures inhabiting it (the kookaburras, owls, magpies, and so on); the milking; the driving into town; the way country neighbours help each other out; the sense of life going on regardless of the little dramas, the kindnesses and the cruelties, that occur. The writing is evocative but has a resigned and rather laconic tone that fits the rural setting. Although a short book – a novella, really – it’s richly textured. There’s the main narrative drive which flips between Harry and Betty and includes flashbacks to their past, occasional dialogue, gorgeous descriptions (“The eucalypts’ thin leaves are painterly on the background of mauve sky – like black lace on pale skin”), and lists of plants, animals, medications, and so on. Interspersed with this main narrative are Harry’s kookaburra log, Betty’s notebook, Little Hazel’s nature diary, and Harry’s letters to Michael. And all this is layered with imagery involving mating, mateship, birds and humans. You can imagine the possibilities that Tiffany teases out from these. It’s all carefully constructed but doesn’t feel forced. It just flows. Not like Betty. His Betty is heavier, more complicated. Betty meanders within herself; she’s full of quiet pockets. The girl Dora might be water, but his Betty is oil. You can’t take oil lightly. It seeps into your skin. It marks you. 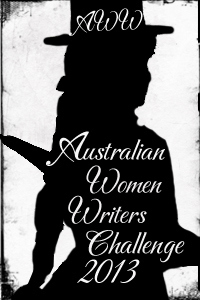 * You may like to read the reviews written by Lisa (ANZLitLovers), John (Musings of a Literary Dilettante), Matt (A Novel Approach) and Kim (Reading Matters). I have no idea why, but I have a fondness for novels set in the 50s . I do too … though I was listening to the South African writer Lauren Beukes yesterday who told the audience in response to some question about the 1950s that “you could wear pretty skirts and bake cupcakes – but that’s all it was – for women”. But I think that’s partly it – that contradiction between the surface and what was going on underneath – isn’t it? Thanks for the mention, Sue. I was very pleased to see Carrie Tiffany on the news the other night, saying that prizes give writers time to write. Ah yes, Lisa, that was the very strong message from the writers at the Prime Ministers’ Literary Awards last year, so it’s interesting for hear her say it too. A lovely response, Sue. I like your theory on human nature vis-a-vis animal nature. And you’re right about her ‘earthy’ writing. That’s a perfect summation. Thanks John … I think this is a book that warrants another reading or two to really “get” don’t you think? It does indeed sound like the book packs a punch. I’ve noticed all the buzz around it and it seems as though it is completely deserving of it. Will have to keep my eye out for this one. I hope it gets published in the States to make it easier to get. I hope so too, Stefanie … Her small town country farmer stories would have resonance there. She’s a great writer. I love her tone … She really nails it. It feels country. Sounds like the author is trying to describe the human race? What an intriguing topic to write a novella on. One thing that particularly stands out for me is the farmer’s personal log, written on his milk ledger, his observations as he follows the K. family. As for ‘my’ owl family, every time I visit them they are motionless. So, not much to jot down, unless I go at night to watch papa hunt and feed the young. Makes me even more keen to read ahead with her first book. Ah for a reading day far from computer and family! Can’t wait to see what you think Catherine …. I really enjoyed Everyman’s Rules for Scientific Living. Deceptively simple in style but unputdownable. I loved the photos in the edition I read. In this situation a picture actually did say 1000 words and add to the story. I haven’t yet given Mateship with Birds but should try and read it this year. I’ve read mixed reviews about it but I think when a book wins a prize people’sexpectations change. I’m guilty of this too I must admit. Oh yes, Orange Pekoe. I loved Everyman’s rules too. An unforgettable book that I read before blogging. Mateship with birds doesn’t have quite the same resonance but deals similarly with the challenges of country life, of the intersection of values and personalities in a small community. It’s well worth reading.